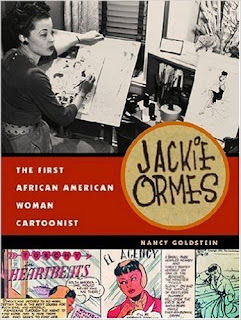 This book looks at the life and art of Jackie Ormes, a pioneering African-American cartoonist. Her artwork, as presented in this book, is good and she had practice in both single panels and strips. She also had a good handle on the humor end of cartooning, although some of her jokes do need a little explaining (which the book does). While it is understandable that Ms. Ormes would be politically active during the period, some of the cartoons are definitely left-wing. What is frustrating is the author's interpretation of the communist subversion of the 1950s... "ACCUSED of membership in the CP" is a typical tag. The only concession that Ms. Goldstein makes to the likes of Noel Field, Alger Hiss and the Rosenbergs is the idea that FBI investigations into spies was "rarely" true. So, Ms. Ormes had an FBI file. She was hardly the only one. Ms. Ormes' attitudes were no doubt common within the African-American community. With her sharp pen, I wonder how critical she would be of many of the race hucksters who prey on that community today. In any case, this book doesn't really look at that. The book does look at Ormes' line of Patty Jo dolls as well.